Large majorities in the 11 emerging and developing countries surveyed either own or share a mobile phone, and in every country it is much more common to own one’s own phone than to share it with someone else. In seven of these countries, half or more now use smartphones – and smartphone use is especially common among younger and more educated groups. Majorities of adults in each of the 11 emerging and developing countries surveyed report owning their own mobile phone. Ownership levels are highest in Vietnam, where nearly all adults (97%) own a mobile device, although about nine-in-ten or more also own one in Jordan, Tunisia, Colombia, Kenya, Lebanon and South Africa. Ownership is lowest in Venezuela, India and the Philippines, but even in these countries about seven-in-ten adults own a mobile device. Sharing tends to be more common among adults with lower levels of education.8 And in India – where women are less likely than men to own their own mobile phones – significantly more women (20%) than men (5%) report sharing a device with someone else. Across these 11 countries, mobile phone ownership (as distinct from phone sharing) tends to vary by several demographic traits, including educational attainment, gender and age. In all countries surveyed, adults with a secondary education or higher are more likely to own their own mobile phone than are those with less than a secondary education. These educational gaps in ownership range from just 3 percentage points in Vietnam to 35 points in the Philippines. Majorities of both men and women own mobile phones in all of the countries surveyed. But ownership rates among women vary significantly across the countries, from a low of 56% in India to a high of 96% in Vietnam. Outside of India – where men are 28 percentage points more likely than women to own a mobile phone – gender gaps in ownership in other countries are either relatively modest (such as the 8-point differences in Kenya and Lebanon) or nonexistent, as in the case of Vietnam and the Philippines. Most of those ages 18 to 29 report owning their own mobile phone in almost all countries surveyed. However, a slightly smaller share of younger Venezuelans – but still a majority at 65% – say they own a mobile phone. A majority of those 50 and older also report owning a mobile phone in most of the 11 countries surveyed. Only in the Philippines do fewer than half of the oldest age group own a phone (46%). Overall, younger people are more likely than older adults to own a phone in the Philippines (41 percentage points), Lebanon (27 points), India (25 points) and Mexico (24 points). For more on how phone ownership and use varies by age, gender or education levels, see Appendix C.
Across the countries surveyed, the 7% median of those who share, rather than own, a mobile phone cite a number of reasons for why they share their phones. About four-in-ten phone sharers in Kenya (42%), Venezuela (40%) and Tunisia (38%) say they share a phone primarily because they cannot afford their own device. Another half of Venezuelan sharers say they now share a phone because their own phone was lost, broken or stolen, as do about four-in-ten Colombians (41%) and Kenyans (41%). Not needing to use a mobile phone regularly is a commonly cited reason for sharing a phone in India (39%) and the Philippines (29%). In India, a sizable portion of phone sharers also name another reason for sharing rather than owning their own device: They think phones are too complicated to use (26%). Smartphones, or phones that can connect to the internet and run apps, are the most prevalent type of mobile device in nine of the 11 countries surveyed: A majority of adults (median of 53%) report using a smartphone. Usage is highest in Lebanon (86%) and Jordan (85%), and lowest in India (32%). Basic phones are generally the most technically limited – and most affordable – mobile phone option. These phones typically only have the ability to make voice calls or send text messages and cannot access the internet or download apps. Feature phones typically fall between smartphones and basic phones in terms of connectivity and price. These devices can access the internet and may offer some of the same features as smartphones, such as the ability to access social media platforms. However, they have fewer advanced capabilities than smartphones and typically do not support apps. Smartphones are the most advanced – and generally most expensive – type of mobile phone. These devices can connect to the internet, run a variety of apps and offer many of the same capabilities of a traditional computer. Respondents to this survey were asked a series of questions to determine the type of mobile device they own or share with someone else. Those who indicated that their phone is a smartphone are classified as smartphone users. Those who said their mobile phone can connect to the internet – but that it is not a smartphone – are categorized as feature phone users. And those who said their phone is not a smartphone and cannot access the internet are considered to have a basic phone. Responses to each of these individual questions can be found in the topline and more information on the combined measures can be found in Appendix B. Basic and feature phones are less popular overall, but some countries stand out for their high usage of these less digitally connected phones. In India nearly half of adults (47%) say they use a basic mobile phone that cannot connect to the internet. Sizable shares in Kenya (40%), Tunisia (37%) and Venezuela (36%) also report using a basic phone. 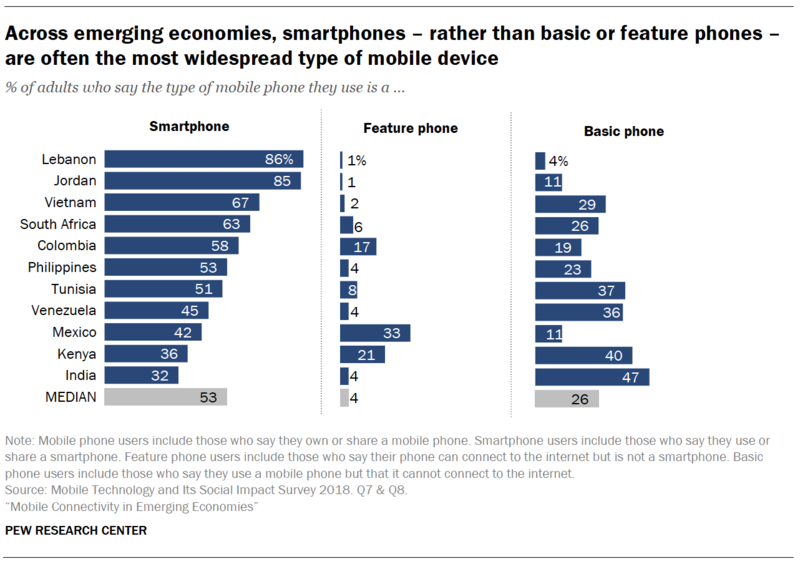 Feature phones are generally the least common devices in the countries surveyed, with few adults (median of 4%) saying they own or share a device that can connect to the internet but is not a smartphone. But feature phones – which offer some of the same features as smartphones, but typically cannot support apps – are popular in Mexico, where one-third of adults say they use this type of device. About one-in-five Kenyans (21%) and Colombians (17%) also use feature phones. Younger adults lead the way in smartphone use in each of the countries surveyed. Across all 11 countries, those under 30 are much more likely to use a smartphone than those ages 50 and older. However, usage rates among 18- to 29-year-olds differ substantially by country, from nine-in-ten or more in Lebanon, Jordan and Vietnam to fewer than half of Kenyans under 30 (46%). Lebanon and Jordan – where smartphones are widespread – stand out for being the only countries where a majority of adults ages 50 and older also report using smartphones. Still, older Lebanese and Jordanian adults are far less likely than their younger counterparts to use a smartphone. People with higher levels of education are also more likely to use smartphones. In each country surveyed, a majority of those with a secondary education or more use smartphones. The education gap is most pronounced in India, where more educated people are 41 points more likely to use a smartphone. In six of these countries, men are somewhat more likely than women to use smartphones. This gap is largest in India, where 40% of men use smartphones compared with 23% of women. While smartphone users are generally younger and more educated, the opposite is true of basic phone users: People who use these more technically limited devices tend to be older and have lower levels of education. Feature phone use doesn’t consistently vary by age or education. However, in Mexico – where one-third of the population uses a feature phone – women (38%) are more likely than men (27%) to report using this type of device. Among the seven online social media platforms and messaging apps asked about on this survey, a median of 62% use Facebook. 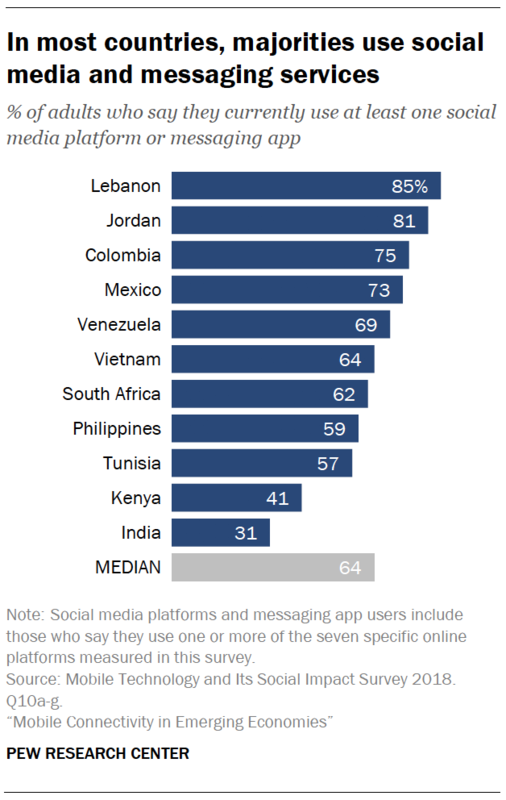 Facebook is most popular in Jordan and Lebanon, where about seven-in-ten adults say they currently use it. Although India has the smallest percentage of Facebook users (24%) of the countries surveyed, the country also has the largest net number of active Facebook users in the world. Facebook, a social networking platform founded in 2004. As of the release date of this report, its interface is available in over 100 languages. WhatsApp, a messaging platform launched in 2009. The service allows users to send text messages and other media, as well as make phone and video calls. WhatsApp’s interface is available in up to 60 languages. Twitter, a social networking and microblogging platform founded in 2006. The Twitter interface is available in 47 languages. Viber, a messaging and voice over platform founded in 2010. Its interface is available in 39 languages. Instagram, a photo- and video-sharing platform founded in 2010. Instagram’s interface is available in up to 36 languages. Snapchat, a multimedia messaging platform founded in 2011. Its interface is available in 22 languages. Tinder, a mobile dating platform founded in 2012. It is available in over 40 languages. For purposes of this report, people who use any one of these seven social media platforms or messaging apps are classified as “social media users.” Responses to each of these individual questions can be found in the topline (link), and more information on the combined measures can be found in Appendix B. The messaging application WhatsApp, which was purchased by Facebook in 2014, is also one of the most widely used digital platforms, with a median of 47% saying they use it. As with Facebook, WhatsApp is most popular in Jordan and Lebanon, where about eight-in-ten or more say they currently use it. The messaging app is least popular in the Philippines and Vietnam, where very few adults use it – 4% and 2%, respectively. Use of the other platforms included in the survey is less widespread. A median of 20% say they use the photo-sharing application Instagram – which is also owned by Facebook – while 10% or fewer report using Twitter or the messaging and photo-sharing app Snapchat. Just 4% of adults in these countries say they use the Viber messaging app, and no more than 3% in any country use the dating app Tinder. But some platforms are more popular in particular countries. For example, about one-third of Lebanese adults (34%) say they currently use Instagram. The messaging app Viber is most popular in Lebanon and Tunisia, where about one-in-five adults report using it. And Jordanians stand out for their use of the photo-messaging app Snapchat (24%). In most countries, each of these social media and messaging services are more likely to be used by younger adults. For example, while 91% of Vietnamese 18- to 29-year-olds say they currently use Facebook, 23% of the country’s 50-and-older population uses the site. 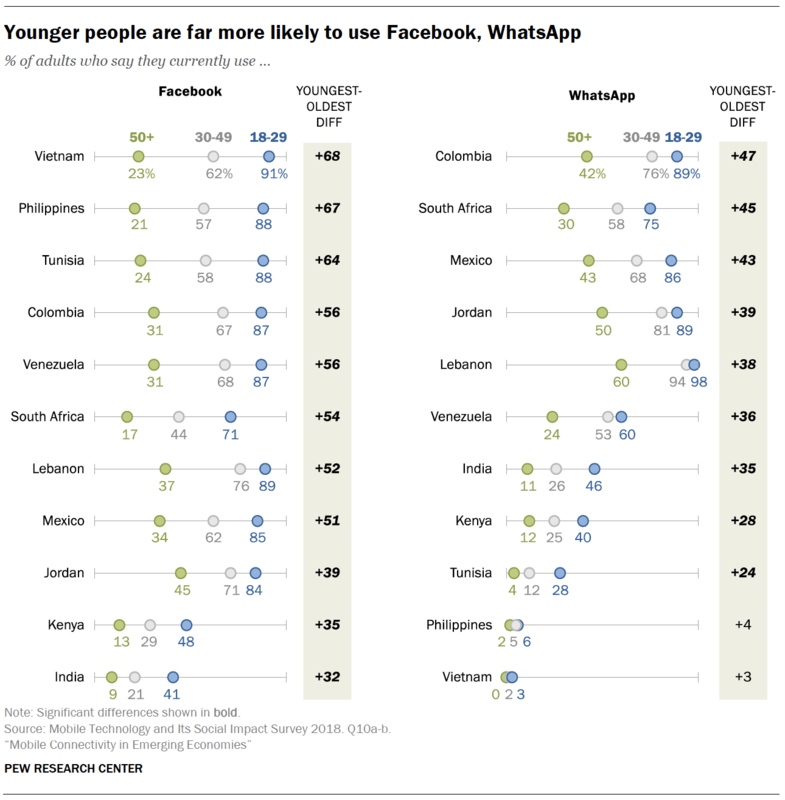 In most of the other countries surveyed, there are also large age gaps in WhatsApp usage. Educational gaps in usage are also significant for most of these services, with people who have a secondary education or higher being more likely to use them. In Vietnam, for example, a large majority of more educated adults (85%) use Facebook, compared with 52% of those with less than a secondary education. In most of the 11 countries analyzed, a majority of adults report using at least one of the seven social media platforms or messaging apps included in this survey. This type of online activity is especially common in Lebanon, Jordan, Colombia and Mexico, where about three-quarters or more use at least one of these services. Kenya and India are the only countries where a majority of adults do not use at least one of these social media or messaging services. 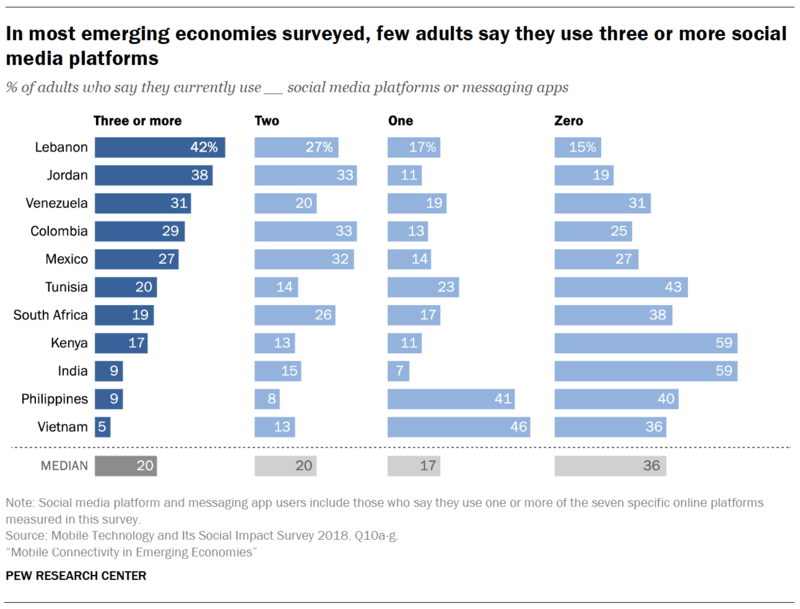 Although it is common to use at least one of these platforms, relatively few adults (median of 20%) say they currently use three or more social media platforms or messaging apps. This level of use is most common in Lebanon and Jordan, where about four-in-ten say they use three or more of these apps (42% and 38%, respectively). About three-in-ten say the same in Venezuela (31%), Colombia (29%) and Mexico (27%). People in India (9%), the Philippines (9%) and Vietnam (5%) are the least likely to report using three or more of these apps. For adults who only use one of the social media platforms or messaging apps included in this survey, two services dominate: Facebook and WhatsApp. Single-platform users rarely report using any of the other five services included in the survey. 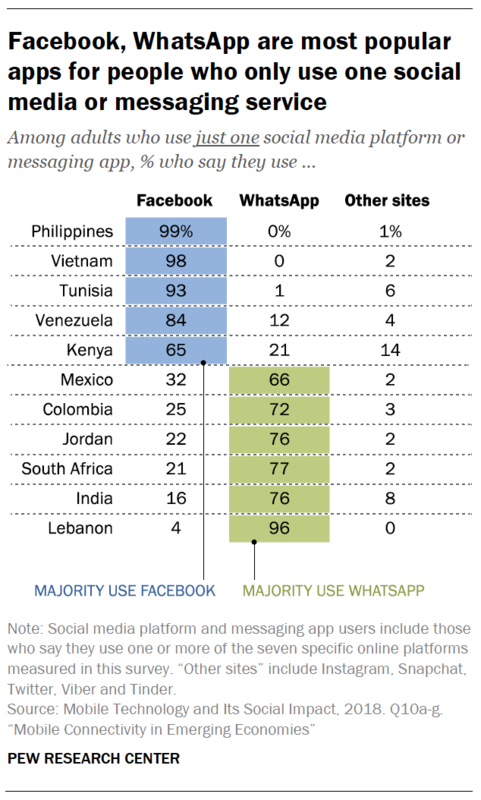 The dominant platform among this group of people who only use one service varies by country: Facebook is most common among single-site users in the Philippines, Vietnam, Tunisia, Venezuela and Kenya. Meanwhile, WhatsApp is most common among such users in Mexico, Colombia, Jordan, South Africa, India and Lebanon. Kenya is the only country where a sizable share (14%) of these single-site users are using something other than Facebook or WhatsApp – in this case, mostly Snapchat (8%). This survey defines an “internet user” as anyone who says they use the internet, who uses at least one social media platform or messaging application, or who owns or shares a feature phone or smartphone. Majorities of adults in every country surveyed except India are internet users. 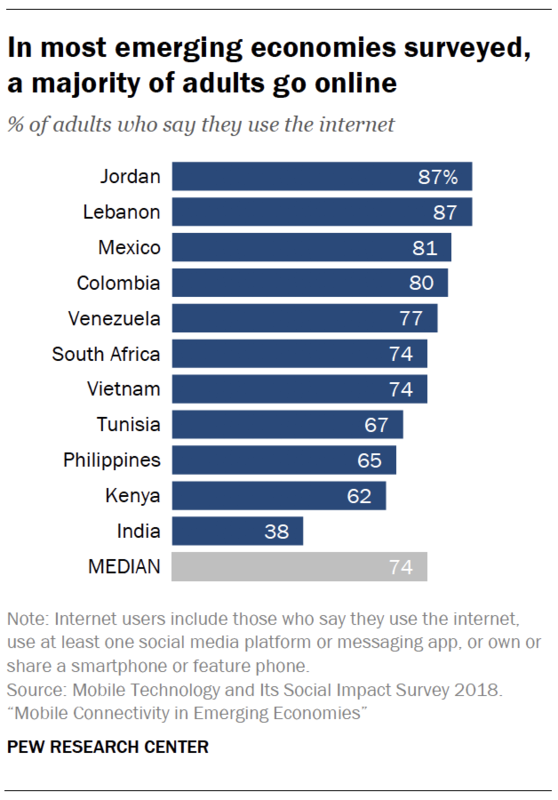 Internet use is most widespread in Jordan and Lebanon, where 87% of adults in each country go online. About eight-in-ten adults also go online in the Latin American countries of Mexico (81%), Colombia (80%) and Venezuela (77%). India has the smallest share of internet users of the countries surveyed: Just 38% of Indians use the internet. However, a majority of Indians ages 18 to 29 (55%) go online, as do a majority of Indians with a secondary degree or more (67%). Use any of the seven major social media or messaging services included in the survey (Facebook, WhatsApp, Twitter, Instagram, Snapchat, Viber and Tinder). Use a smartphone or feature phone that can connect to the internet. Responses to each of these individual questions can be found in the topline (link), and more information on the combined measures can be found in Appendix B. Similar patterns regarding age and education are found in the other 10 countries surveyed: Younger and more educated people are more likely to go online. In eight of these countries, gender differences in internet use are either nonexistent (in the case of Colombia, the Philippines, Venezuela and Vietnam) or modest (in the case of Jordan, Lebanon, Mexico and South Africa). These differences are most prominent in India, Kenya and Tunisia, although majorities of both men and women in Tunisia and Kenya go online. In India, 46% of men and just 29% of women use the internet. To some extent, these gender gaps in internet use coincide with differences in smartphone use, as men in both countries are more likely to use smartphones than women. For more on how use of the internet and of specific social media platforms and messaging apps vary by age, gender or education, see Appendix C.
In most of the countries surveyed, relatively few people (median of 34%) have access to a desktop computer, laptop or tablet in their household. The exception is Lebanon, where a majority of adults (57%) say they have access to such a device. As with most other measures of technological connectedness, those who are younger and more educated are generally more likely to have access to a computer or tablet at home. 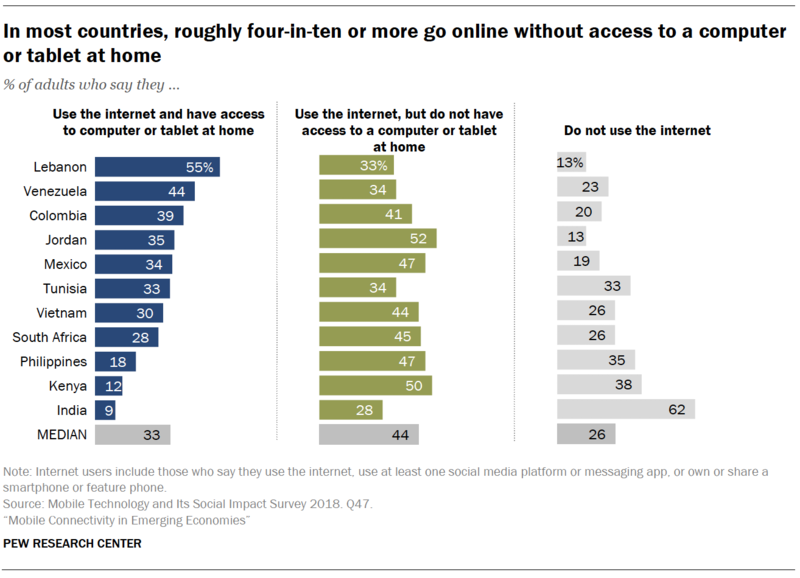 Anywhere from 28% (in India) to 52% (in Jordan) of adults in these countries use the internet in some fashion but do not have a computer or tablet at home. 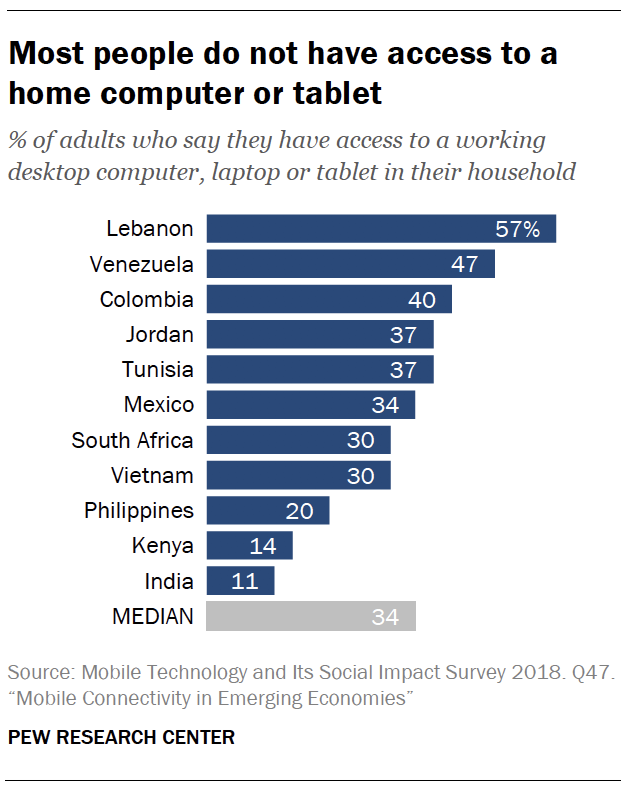 And a median of 27% of adults in these countries say they do not have a tablet or computer at home but do have a smartphone, ranging from a low of 18% in Venezuela to a high of 50% in Jordan.